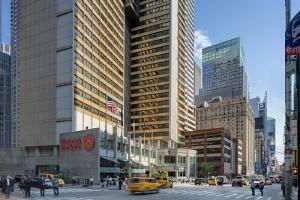 Located between Central Park and Times Square in the center of Manhattan's midtown business and entertainment district. Retreat and rejuvenate in the contemporary guest rooms, which have the look and feel of an upscale home. Details include rich jewel-tone colors, cozy duvet covers, and an oversized work desk positioned for dramatic city views.